Is there a fine line between funk and rock? This week’s track is a top 20 hit from 1976 which I’ve always classed as a funk track and that snuggles in beautifully between songs like Black Betty, Play That Funky Music and any of James Brown’s repertoire, but not too long ago, Classic Rock Magazine listed it at number 87 in their all-time Top 100 classic rock Songs, that track is Low Rider by War. The original group started out as The Creators, playing clubs in the Los Angeles area, where they became the first black band booked on the Sunset Strip. After a few months they changed name to Nite Shift – so called because the drummer, Harold Brown, worked at a steel yard at night. Their big break came when record producer Jerry Goldstein conceived the idea of finding a group to back Eric Burdon, following his departure as lead singer with The Animals. In 1969 Jerry attended the Rag Doll in North Hollywood and saw a footballer called Deacon Jones, but what caught his eye was his backing band. He paired them up with Burdon and spent a few months touring around Southern California to discover how they were received before they recorded their debut album Eric Burdon Declares War. After two albums and three American hits including the number three Spill the Wine, Burdon left and the band would continue without him. The original line up consisted of lead singer Lonnie Jordan, bassist B.B. Dickerson, guitarist Howard E. Scott, Charles Miller on sax and flute, Lee Oskar on harmonica, percussionist Papa Dee Allen and drummer Harold Brown. They were a multi-racial group who developed their own unique sound to incorporate funk, jazz, Latino, rock and soul. “We never thought we’d hit because we were too different,” says Jordan, “people wanted us to be like the Chambers Brothers or Sly and the Family Stone. But we just let it flow and played.” There was an ever changing line up because various members kept getting drafted to the Vietnam War. The hits came thick and fast in America and they hit the top 10 with The World Is a Ghetto (1972), The Cisco Kid and Gypsy Man (1973) and Why Can’t We Be Lovers in 1975. Their first international hit, Low Rider, reached number seven Stateside and number 12 in the UK. Like much of James Brown’s material, Low Rider has been sampled on numerous songs usually tucked away on various albums, but most notably on the Offspring’s 2000 top 10 hit Original Prankster. It was also used as the theme to the ABC sitcom The George Lopez Show and as the opening song in the 1978 Cheech & Chong comedy movie Up in Smoke. It also featured in A Midsummer’s Nice Dream – a 2011 episode of the Simpsons and more recently, in 2014, in an American advert for the drug Crestor. 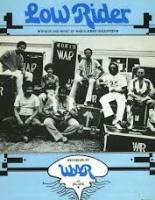 In 2008 there was a sort-of one-night only reunion between Eric Burdon and War – well Lonnie Jordan as no other members were invited to be part of it. In 2014 they were nominees for induction into the Rock and Roll Hall of Fame.